Tag Archive | "najib tun razak"
The online shopping trend in Malaysia is healthy according to the leading eCommerce marketplace, eBay Malaysia. The country manager Ambareeesh Murty said that it is driven by the high broadband penetration rate in the country. Prime Minister Datuk Seri Najib Tun Razak said the broadband penetration in Malaysia exceeded the original target of 50 percent to 55.6 percent. Ambareesh told in a recent interview, online shopping in any market has fundamental requirements, and a key requirement is the use of broadband. He added that broadband penetration in the Malaysian market is already surging. Because of the convenience it offers, online shopping is getting popular in the country. A survey from MasterCard showed that 30 percent of Malaysians made online purchases in 2009, which increased to 50 percent last year. Ambareesh said that the trend is positive and they are very optimistic about online shopping. Malaysia ranked number three in online shopping based on the 2010 Visa e-Commerce Consumer Monitor. The country has spent an average amount of $2,006 for the past 12 months. They are behind Taiwan with $4,041 and China with $2,557. EBay Inc, a world’s online marketplace, allows trade on local, national and international basis. It provides an online platform where millions of items can be sold each day. 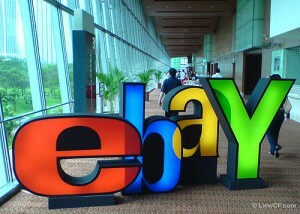 EBay Malaysia, a completely-owned auxiliary of eBay Inc, offers three ways to sell products or services. Those are auction, fixed-price and classifieds. It offers an easy, safe and trusted trading platform for their customers, Ambareesh said. He explained that the company will continuously improve and enhance the features and tools on its website to give a better experience for users.